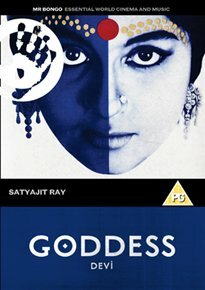 A classic rural drama from legendary Indian director Satyajit Ray. A classic rural drama from legendary Indian director Satyajit Ray. While her husband Umaprasad (Soumitra Chatterjee) is away studying in Calcutta, Doyamoyee (Sharmila Tagore) stays at home in Chandipur looking after her father-in-law Kalikinkar Roy (Chhabi Biswas), the wealthy and widowed village elder. In a dream, Roy has a vision of Doyamoyee as a reincarnation of the goddess Kali, of whom he is a devotee. The next day he insists to the other villagers that she be worshipped as such, and when a dying child is miraculously cured at the feet of his daughter-in-law, the news quickly spreads, bringing the sick and ailing from far and wide. But when the news finally reaches Doyamoyee's husband Umaprasad, he quicky sets off for home, determined to rescue his wife and put an end to the madness. While her husband Umaprasad (Soumitra Chatterjee) is away studying in Calcutta, Doyamoyee (Sharmila Tagore) stays at home in Chandipur looking after her father-in-law Kalikinkar Roy (Chhabi Biswas), the wealthy and widowed village elder. In a dream, Roy has a vision of Doyamoyee as a reincarnation of the goddess Kali, of whom he is a devotee. The next day he insists to the other villagers that she be worshipped as such, and when a dying child is miraculously cured at the feet of his daughter-in-law, the news quickly spreads, bringing the sick and ailing from far and wide. But when the news finally reaches Doyamoyee's husband Umaprasad, he quicky sets off for home, determined to rescue his wife and put an end to the madness.